On older gentleman stepped towards the curb and angrily waved me down as I took a picture of this establishment. He probably thought I was casing the place for something more sinister than common interest. However, I couldn't get down to explain my actions because I was pressed for time and after-school traffic in the area was unbearable. The location looks like a neighborhood auto shop, but I couldn't tell for sure because I was more focused on the campaign sign near the walkway, and the accompanying light blue commode to its side. 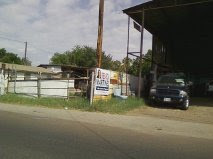 Nothing out of the ordinary in the barrio, really; it's just somebody's idea of eye-catching outdoor decor. But perhaps from a practical sense where certain things don't go well together, the pairing of a commode and a campaign sign is a serious visual don't.